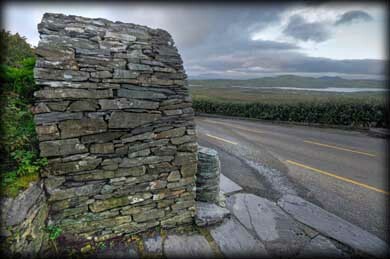 On our way from Portmagee to Ballinskelligs Priory, we took the Skellig ring drive through Coumanaspig Pass. The road takes you over the mountain to the beautiful St Finians Bay. The views of Valentia Island and Cahersiveen are really stunning from the pass. 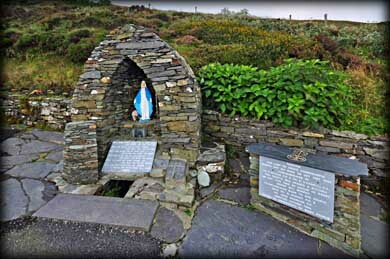 On your right as you climb the road you will come to a shrine dedicated to The Blessed Virgin Mary. At the base of the shrine is a small well known locally as Tobairin Holy Well. The shrine is only in existence since 1994 but the well was clearly celebrated long before that. 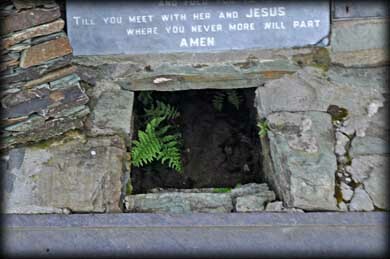 There are a number of cross inscribed stones situated around the well. 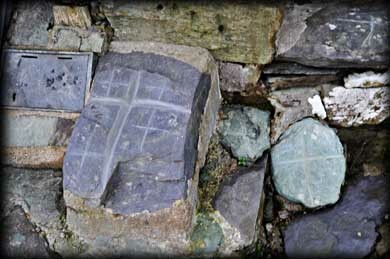 These crosses were scratched onto the stones by the many pilgrims who visited the well. A view of Valentia Island from the top of Coomanaspig on the Skelligs ring road. The bridge at Portmagee is on the extreme left. Geokaun Mountain in the centre of the image is the highest point on Valentia. The pass also offers wonderful views of the Skelligs and St Finian's Bay on the winding descent down the mountain to Cloghanecanuig townland. A visit to the Skelligs Chocolate Factory is also recommended to calm the nerves after the hairpin bends you will encounter on your way down. Situated: From Portmagee on the Ring of Kerry head Northwest on the R365. This road will take you onto the Skellig ring road. After 4 kilometres you should see Tobairin Shrine on your right. Discovery Map 83: V 3648 7001. Last visit Sept 2012.